We all have busy lives and we don’t always have the time to properly “take care of ourselves.” That’s where Chair Massage comes in handy. I can address a lot of key issues in the body in just 12 to 20 minutes. Chair massage is typically done in a public setting. 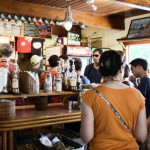 I am currently working out of Alfalfa’s Market and the Trident Booksellers and Cafe as well as a few corporate settings. Because it is out in the open you are fully clothed and the time frame is typically shorter than a table massage. 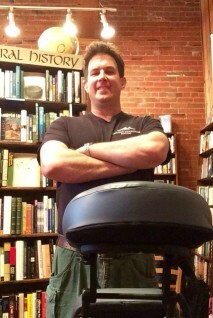 I have been doing chair massage for over 10 years. It is a great way to meet people and give them a sample of my work. Some of my regular clients get Chair Massage exclusively. Chair massage is becoming a lost art form. Not all massage therapists are trained in it anymore. 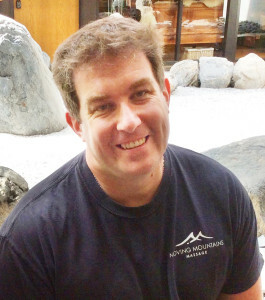 It is something I feel passionate about – that is why Moving Mountains Massage was born. I hired a team of massage therapists who share my vision. I want people to be able to come to Alfalfa’s and the Trident knowing they will get a quality massage from anyone on my staff. Chair Massage makes it possible to find some relaxation in tough economic times. You can get massages on an on-going basis at an affordable price. I am willing to give anyone a 6 minute sample of my work. A full session is 30 minutes. 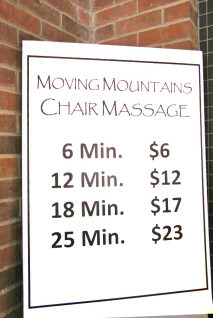 Also, the more time you get, the lower the price: 18 minutes is $17, 25 minutes is $23. It’s a good deal! The best part of my job is to help someone feel better and more relaxed.